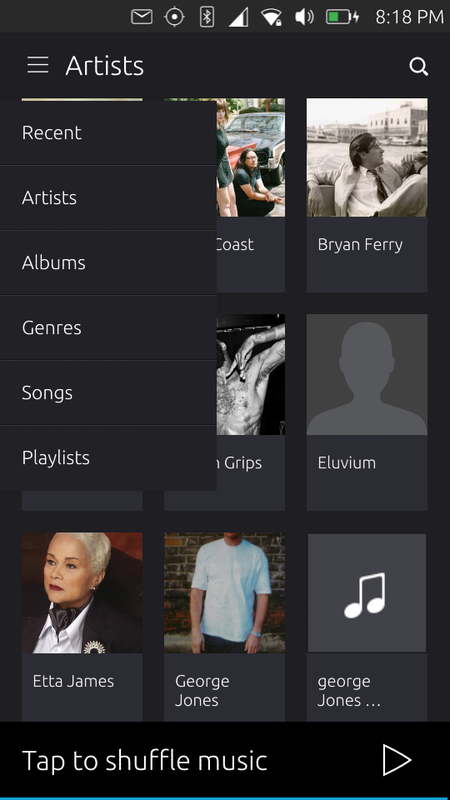 Very minor but doesn't look designed, will add a screenie--under the "Albums" label. Depends on the scrolling state, roll-down state of header. I can confirm that this occurs, but it looks likely to be from the ubuntu-ui-toolkit, therefore I am adding the ubuntu-ui-toolkit package to this bug report. Are you using Tabs, or the PageHeader (with leadingActionBar.actions to navigate between Recent, Artists, ...)? If you are using Tabs, I recommend that you switch to the PageHeader, which also works fine in an AdaptivePageLayout which is useful for convergence. If the bug is with the PageHeader, can you include (small) example code to reproduce the issue? Thanks. ^I added Ubuntu UX to the bug so the designers can decide. @Tim, This is still valid on the latest music-app on rc-proposed.